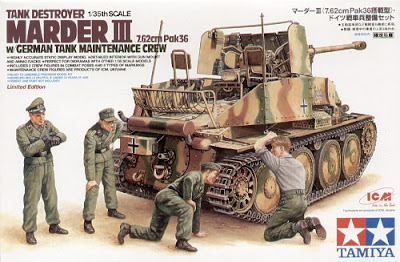 I took the Tamiya Marder III home. This is the kit with the ICM maintenance figures. 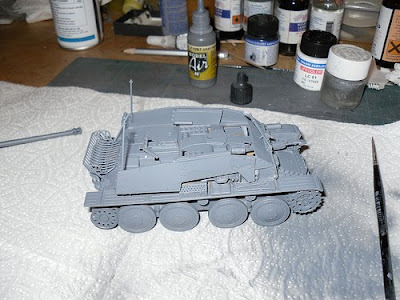 The last time that I tried three colour camo, I made it very dark on a PzIV JadgPanzer so I need to get this one right. The kit went together as any Tamiya kit does. It was bit complicated in parts and I made my usual silly mistakes. Once I told my wife 'you know that with a Tamiya kit, if it doesn't fit, then you have got it wrong'. I then proceeded to mess about with things and finally got the top of the chassis on incorrectly. Fortunately, it doesn't notice! I bought a Jordi Rubio metal barrel for it which seems to be a bit thicker than the plastic one because the barrel clamp doesn't fit. 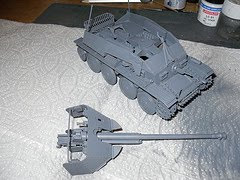 I want to do a small diorama with a dropped track so I am getting some metal tracks this week. 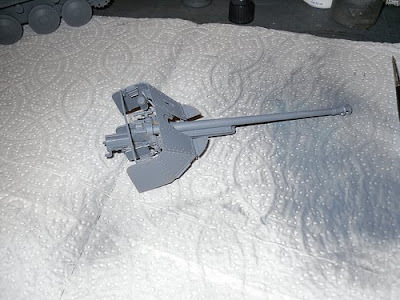 Here are the pictures in grey primer. Tonight, I put the three colour camo on (tri-tonal - as MIG have it). I will post some pictures tomorrow. Hopefully, now I can get on with detail painting.